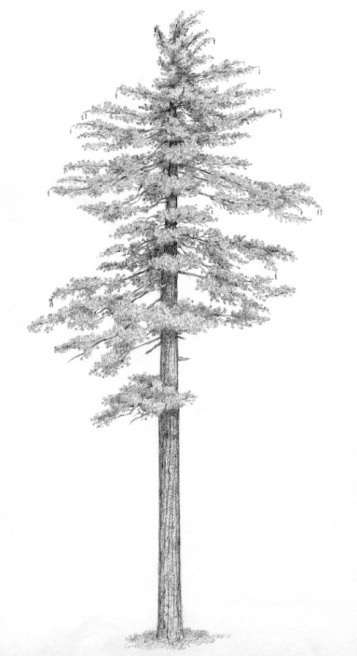 In 1882, Albert Kellogg described the sugar pine (Pinus lambertiana) as a “vast sylvan condor”. Such a lovely simile deserves a closer look. 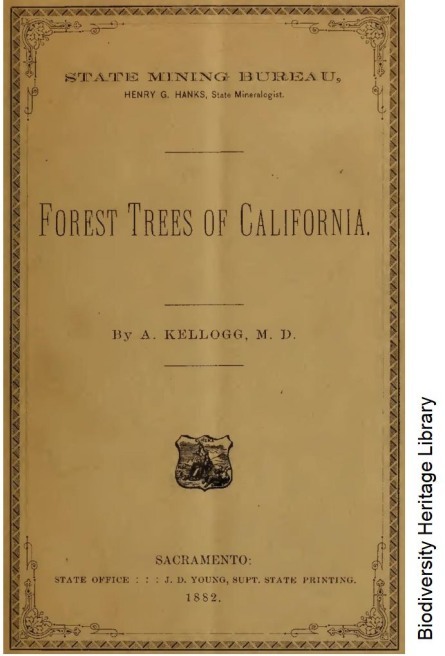 Kellogg’s Forest Trees of California was published by California’s State Mining Bureau in 1882. One of the most magnificent pines the world ever saw is the Great Sugar Pine of California! The excellent illustration above is by Matt Strieby (and shown here with his kind permission). The uncredited photo above is from a 1916 report by Louis T. Larsen and T. D. Woodbury. … an open crown composed of a few long, nearly horizontal branches, with long cones, mostly solitary hanging from the ends of these branches. Just as the California condor is an exceptionally large bird, the sugar pine is an exceptionally large tree. The Champion Tree National Register maintained by American Forests lists a sugar pine 241 feet tall with a crown spread of 48 feet. … the titan of North American pines, … the largest and stateliest of all native pines. So given the sugar pine’s size, accommodating branches, and location in condor territory, I expected to be able to find photos of California condors roosting in sugar pines. But my search yet to be successful. I would welcome learning of such photos. At the head of Sisquoc canyon and in other similar high areas yellow pines (Pinus ponderosa and P. jeffreyi) are the main roosting trees although sugar pines (P. lambertiana) are also used. No consideration of sugar pines would be complete without noting the extraordinary size of the (female) cones. Elias lists them as being up to 18 inches in length. Guinness World Records reports that the world’s longest pine cone is a 22.9 inch cone from a sugar pine. It is remarkable that these large cones are held at the tips of sugar pines’ long, horizontal branches (look close at the drawing of the sugar pine above). No two are alike, even to the most inattentive observer; and, notwithstanding they are ever tossing out their immense arms in what might seem most extravagant gestures, there is a majesty and repose about them that precludes all possibility of the grotesque, or even picturesque, in their general expression. They are the priests of pines, and seem ever to be addressing the surrounding forest. Surely those words could also be applied to the California condor! Albert Kellogg’s “vast sylvan condor” reached an audience well beyond the readers of his State Mining Bureau report. The report was excerpted in the 11 November 1882 issue of the Pacific Rural Press, a widely-read magazine of the time. For more on the relationship between California condors and trees, see the post Live trees or dead trees? Larsen, Louis T, and T D Woodbury. Sugar pine. Bulletin 426. USDA. 1916. Randall, Warren R, Robert F Keniston, Dale N Bever, and Edward C Jensen. Manual of Oregon trees and shrubs. Revised edition. Oregon State University. 1990. Elias, Thomas S. 1989. Field guide to North American trees. Revised edition. Grolier. 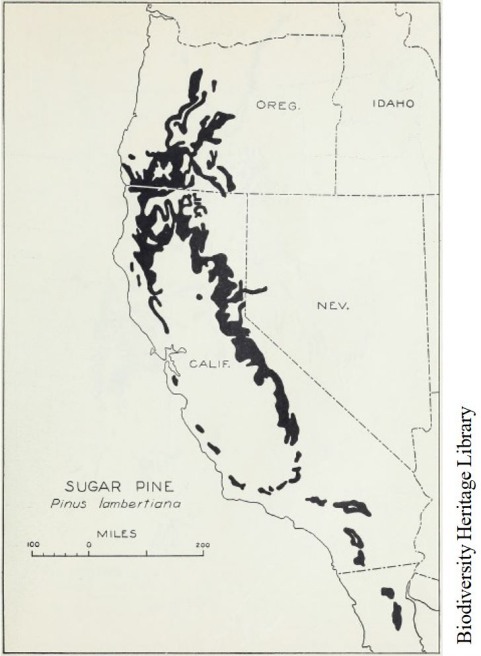 Munns, E N. The distribution of important forest trees of the United States. Miscellaneous Publication 287. USDA. 1938. Koford, Carl B. The California condor. Research Report 4. 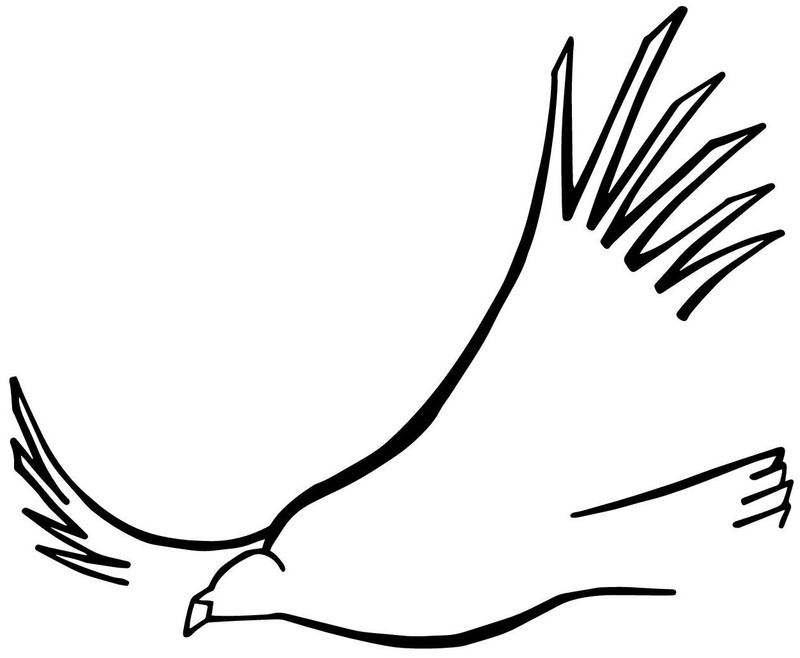 National Audubon Society. 1953. Muir, John. The mountains of California. Century. 1898.